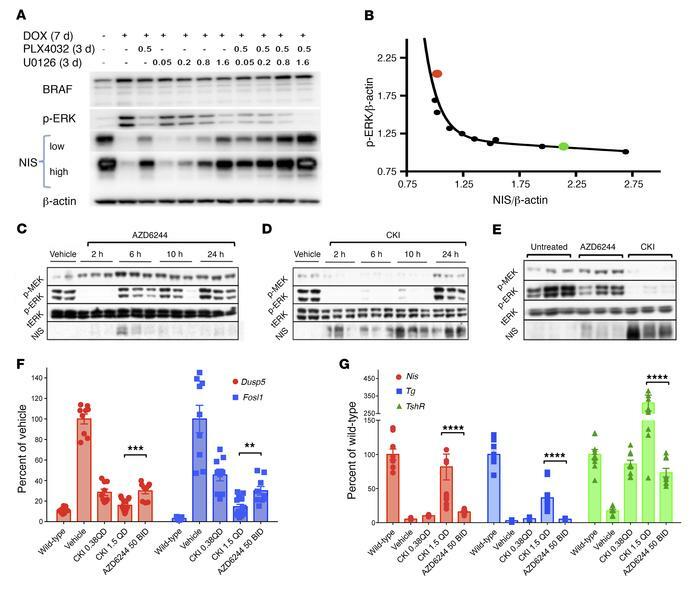 Profound inhibition of MAPK signaling is required to restore differentiated gene expression in thyroid PCCL3-BRAF cells and in murine BrafV600E-induced PTCs. (A) Western blots of PCCL3-BRAF cells treated with dox for 4 days to induce BRAFV600E, and then for 3 days with the indicated concentrations (μM) of PLX4032 or U0126. (B) Graph shows loading-adjusted p-ERK vs. NIS levels from the Western blot. The large green and orange dots indicate the –dox and +dox conditions, respectively. (C and D) Western blots of PTCs from TPO-Cre LSL-BrafV600E mice treated with vehicle, AZD6244 (50 mg/kg twice per day), or CKI (1.5 mg/kg/d) for 3 days. On the fourth day tissues were harvested at the indicated times after dosing while remaining on the same treatment schedule. Vehicle lanes represent mice that never received active compound (they do not represent a time 0). (E) Western blots of TPO-Cre LSL-BrafV600E mouse PTCs (n = 3) treated with the indicated compounds for 4.5 days. Thyroid lobes were collected 2 hours after the final dose. (F and G) Quantitative RT-PCR of MAPK transcriptional output markers (F) or iodine metabolism–related genes (G) in thyroid tissues from mice treated with the indicated doses of AZD6244 (n = 3) or CKI (n = 5) for 4.5 days. Data represent percentage change in β-actin–normalized expression compared with vehicle-treated TPO-Cre LSL-BrafV600E (F) or wild-type mice (G). **P = 0.008, ***P = 0.0003, ****P < 0.0001, Mann-Whitney test. QD, once per day; BID, twice per day; tERK, total ERK.